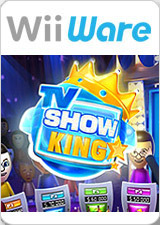 TV Show King is a quiz video game by Gameloft. It was released as one of the WiiWare launch titles in North and Latin America on May 12, 2008. Become King of a TV trivia show in TV Show King! Confront friends and family in a TV quiz game show! Let your Mii try to answer fun and challenging trivia questions, from the classics to original stumpers, spanning across history, geography, literature, science, sports and entertainment! For an extra challenge, use your Wii Remote in original ways. Make it to the finals and see who can win the greatest amount of cash in one last, ultimate duel. TV Show King will challenge your brain! Now, get ready… get set… and go play TV Show King! Flickering in this title can be fixed by enabling XFB. Fixed with Hybrid XFB in 5.0-5874. The graph below charts the compatibility with TV Show King since Dolphin's 2.0 release, listing revisions only where a compatibility change occurred. 3.0-735 Windows XP AMD Athlon II X2 215 @ 3.4GHz NVIDIA GeForce GT 440 Get 50-55% of speed. If set FrameBuffer=Real - where will be no flickering, but screen will shake up & down by 2px. Also Mii has no eyes (some problem with "EFB copy to texture" or "virtual frame buffer" - not sure). †.fl.l).